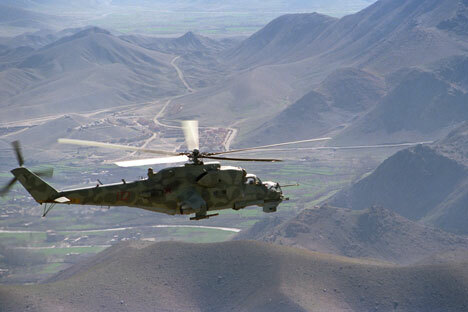 A Mi-24 helicopter on a mission in the vicinity of the Kabul-Herat road. The Mil helicopter plant, located outside Moscow, has become a world leader in the manufacture of attack helicopters over the past six decades. Originally founded as a small design bureau, the Central Aero-hydrodynamic Institute in Zhukovsky, under Mikhail Mil was, in 1947 Russia’s largest aviation research centre. It was actually a Russian who conceptualised and first devised the modern helicopter, (notwithstanding Leonardo da Vinci’s 15th-century sketches). Igor Sikorsky, an engineer, developed the first prototype of the helicopter in Kiev, between 1908 and 1911. Tempestuous events of the early 20th century (World War I and the 1917 Revolution) soon overtook his path-breaking invention and determined a different course for his creation. Soon after the revolution, the gifted inventor emigrated to relocate in the United States where, in 1923, he founded an aircraft manufacturing company bearing his name. His legacy, however, remained in the minds and workshops of Russian engineers. In the United States, Sikorsky’s company built planes for over 10 years before it made a mark in this new niche area of aviation in 1939. On both sides of the Atlantic, the multiple benefits of small aircraft like helicopters were quickly understood. They could be used more widely than large aircraft and gain access to more remote areas, because they required no specified airfields. Of immense value also, was the ability of the helicopter to hover in the air and manoevre at low altitudes, opening a vast field of applications in both civilian and military spheres.